Our unique Hawaii ocean kayak tour is set against a breathtaking rainforest backdrop. On this kayaking trip you will experience the remote and breathtaking beauty of Kualoa, one of the most historically significant places on Oahu, while enjoying a kayak tour along Hawaii’s scenic windward coast including Chinamans Hat. This Rainforest to Reef Adventure combines the scenic backdrop of the lush Hakipuu Valley, the majestic volcanic Koolau Mountain ridge, with the tranquil cobalt and turquoise ocean waters of Kaneohe Bay. 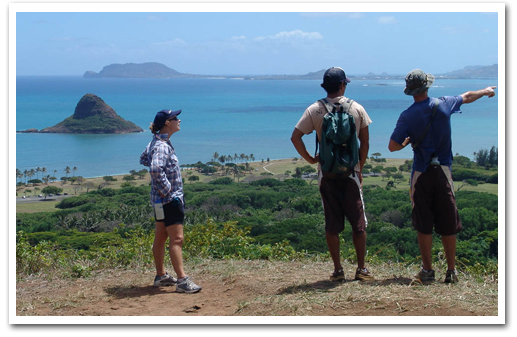 Your Hawaii kayaking adventure will begin with a short hike to a scenic overlook at the entrance to Hakipuu Valley. Here you’ll have the chance to capture an aerial perspective of the breathtaking beauty and landscape, from its forested valleys to its inviting ocean reef waters below. View the 800-year old Molii fishpond (one of the last remaining ancient Hawaiian fishponds in the State). This 125-acre rock-walled enclosure was hand-built by ancient Hawaiians to maintain a ready supply of live ocean fish. As part of the privately-owned 4,000 acre Kualoa Ranch, you’ll have the rare opportunity to see an ancient Hawaiian treasure that most visitors to Oahu never get to see. From this point on, your kayak trip will continue to unfold with one unforgettable highlight after another. 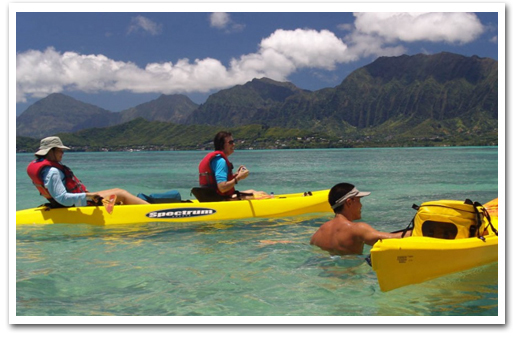 Once completing your kayak instruction, you’ll paddle along the tranquil and glassy waters of Kaneohe Bay. 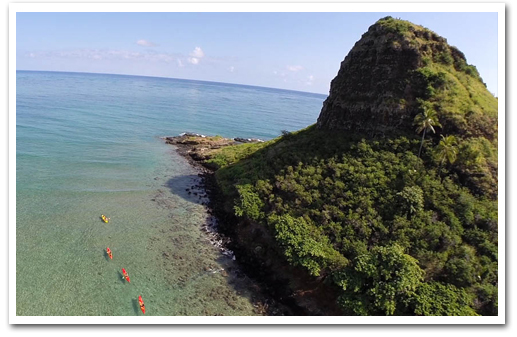 Because of the protected reef that surrounds this area, this is one of the safest places for kayaking on Oahu. You will be delighted to know that this is an actual kayaking tour where you paddle yourself on sit-on-top kayaks. We do not tow you around via a smelly outboard motorboat. You'll journey by kayak as you glide along the tranquil waters fronting Kualoa (and Kualoa Ranch), listed on the National Register of Historical Places, to Mokoli`i (Chinaman’s Hat) Island (less than one-mile paddle offshore). This tiny offshore island in the country becomes your playground for relaxation, enjoyment and a picnic lunch. Whether you want to relax, explore around the island, or return to the ocean for a quick snorkel to see the underwater world, you’re certain not to want to leave. Includes: Professional nature guides, complimentary round-trip transportation from Waikiki, access to private land, kayak, snorkel equipment and instruction (use of single or tandem), paddle, life jacket, dry bag, lunch and beverage. Fresh water showers and changing are available at beachfront. What to Bring:Swim suit, towel, sunscreen, hat, sunglasses, water-proof camera. Wear shoes and socks for hike.